This is a type of rehabilitation performed by occupational and physical therapists on patients with conditions affecting their hands and upper extremities. It requires a high degree of specialization obtained through continuing education and experience. Treatments can be preventative, centered on the management of acute or chronic pain, or involve sensory re-education after nerve injury, among other things. Conditions we treat include carpal tunnel syndrome, rheumatoid arthritis, rotator cuff injuries, fibromyalgia, golfer and tennis elbow, post hand/wrist/elbow/shoulder fracture, post CVA/stroke and most sports injuries. Orthotics and the development of custom splints deals with the science of support and/or bracing of weak or ineffective muscles or joints. Custom splints are also used to align, prevent or correct deformities of a body part or to assist in strengthening a physical weakness or improve the functioning of movable parts of the body. 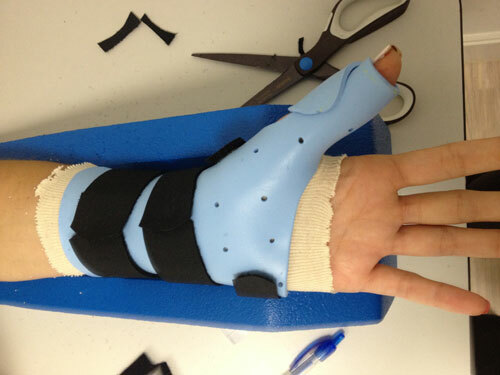 Custom fabricated hand based thumb spica splint. Used for the following conditions: Thumb CMC osteoarthritis, MPJ ulna collateral ligament/Radial collateral ligament of the thumb. Used for the following condition: Ganglion cyst, distal radius/ulna fractures, carpal fractures, carpal tunnel syndrome, ulna complex/TFCC injury, tenosynovitis, cellulitis to the hand. Purpose: Immobilize metacarpal and or proximal/middle phalanx of finger. Used for the following conditions: Fracture to the metacarpal, proximal/middle phalanx of finger. Length of splint is longer for proximal and middle phalanx fracture towards the finger tip. 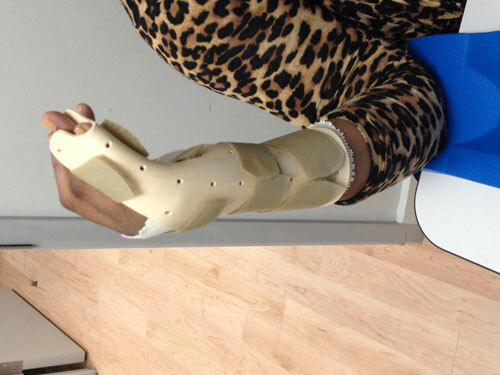 Purpose: Immobilize wrist and finger for proximal/middle phalanx fractures. Used for the following conditions: Fracture proximal/middle phalanx of finger. 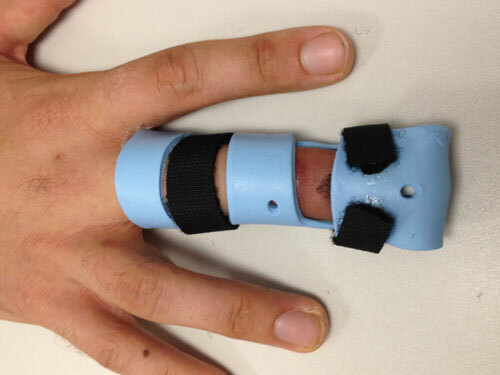 Length of splint is longer for proximal and middle phalanx fracture towards the finger tip. Used for the following conditions: Distal phalanx fracture, mallet finger injury. Used for the following conditions: Central slip/boutonniere injury to finger, swan neck deformity. Purpose: Hold PIP joint of finger into full extension. Used for the following conditions: Swan neck deformity in finger. Used for the following conditions: Post-operative placement of pin for middle/distal phalanx fractures or dislocations. 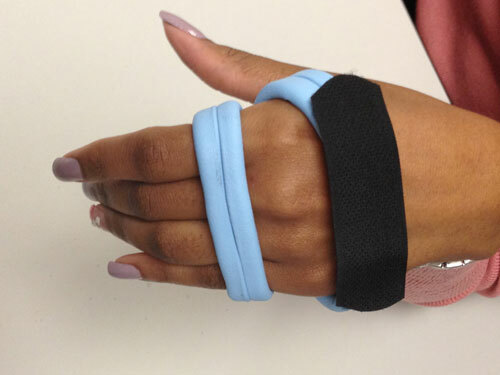 Purpose: Immobilize wrist along with the thumb. Used for the following conditions: Scaphoid fracture, scaphoid-lunate ligamentous injury, DeQuervain’s syndrome, thumb metacarpal fracture. Used for the following conditions: DeQuervain’s syndrome, thumb metacarpal fracture. Purpose: Rest/immobilize hand and wrist secondary to fractures, swelling, stiffness associated w/ trauma and or infection to the hand. Used for the following conditions: Cellulitis, severe edema to fingers, multiple fracture sites to fingers. 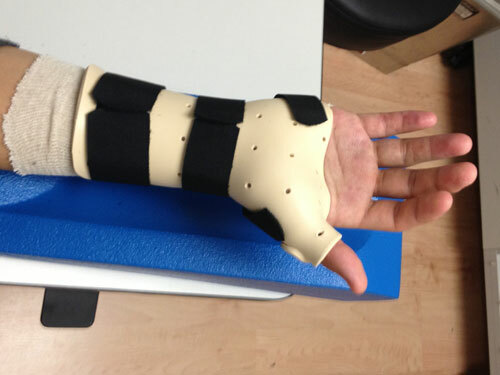 Purpose: Immobilize/protect fingers and wrist limiting allowed motion following flexor tendon repair. 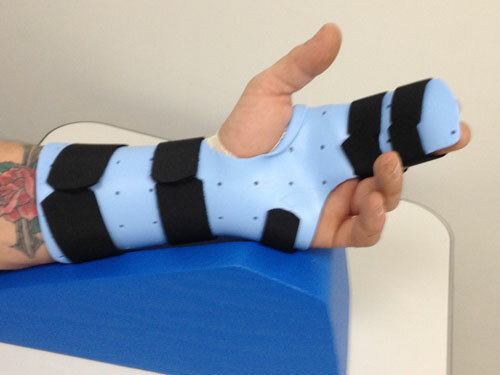 This splint immobilizes surgically repaired fingers; at the same time allows freedom of motion for uninvolved fingers to enhance function while recovering. Used for the following conditions: Flexor tendon repairPicture 36: Custom fabricated PIP/DIP Strap:Purpose: Decrease intrinsic tightness in fingers following traumaUsed for the following conditions: Finger trauma, joint contractures, volar plate injuries, overall stiffness in fingers. Purpose: Immobilize fracture or injured elbow. Used for the following conditions: radial head fracture, proximal ulna fracture, distal humeral fracture, elbow joint effusion. Purpose: Provide circumferential pressure/immobilization to humeral fractures. Used for the following conditions: Humerus fractures to the upper arm.